In The Little Regiment by Stephen Crane we have the theme of conflict, love, responsibility, pride, vulnerability and camaraderie. Narrated in the third person by an unnamed narrator the reader realises from the beginning of the story that Crane may be using the setting of the story to explore the theme of conflict. 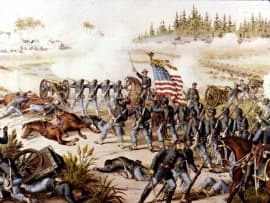 Set during the American Civil War both Billie and Dan are both on the same side yet one would not think this by the way that both brother’s interact with one another. Which may be the point that Crane is attempting to make. He may be taking Billie and Dan’s relationship as a microcosm of what was happening during the war with neighbours fighting neighbours and family members fighting family members. If anything there was a division that existed in America which are mirrored by the relationship that both Billie and Dan have with one another. However it is interesting that both Billie and Dan are protective of each other. They won’t let the other get into trouble. Which is somewhat ironic considering the open hostility between both men. It may also be a case that Crane may be suggesting that the reality is that despite their difference’s both Billie and Dan really love one another. There is also a sense of paralysis in the story. Throughout all the fighting that takes place between both sides. Very little is gained. Which may be the point that Crane is attempting to make. He may be suggesting that the war between both sides was in reality futile. There were other ways for those with a responsibility to settle their differences. It is also interesting that the missed opportunities to settle their differences is mirrored by Billie and Dan’s inability to forgo any differences they may feel about one another. Billie in particular holds a grudge against Dan and tries to punish him by using silence. Though ironically he is concerned about Dan’s well-being when Dan is called to do special duty. It is as though there is an unbreakable bond between both men yet Billie may not necessarily be prepared to admit to it. Symbolically this unbreakable bond is in contrast to the desires of the Confederate army which attempted to break up the Union. Hence the Civil War. It is also noticeable that there is a level of camaraderie that one would expect to see among fellow soldiers. With many of the soldiers teasing Billie and Dan about their relationship but at the same time being respectful of it. Knowing that as brothers they have a close bond to one another even if this does not seem to be the case throughout the story. It is also interesting that emotionally Billie and Dan give very little away to one another. It is as though they do not wish to show one another any weakness. Crane could be suggesting that with conflict comes a defense mechanism in whereby one person will not show another person their weaknesses. Which in a war is what one side would be looking to find in the other side. The title of the story is also interesting as it can be interpreted in several ways. Firstly it can be seen to be symbolic. The regiment having lost so many men still prevailed. Another way to look at the title is through the lens of how the men in the regiment might feel. They might feel proud of their achievements which might have been considered to be unexpected. Thirdly Crane could be using the word ‘little’ to describe the childish behaviour that Billie and Dan partake in. In many ways they act like children. Trying to get the better of one another by hurting one another. The end of the story is also interesting as the reader realises that Billie has broken his vow of silence when it comes to Dan. It is as though he has realised how serious things are and has swallowed his pride. Acknowledging his brother and being happy that he is still alive. On the other hand it is also clear to the reader that Dan had concerns for Billie’s well-being which would explain his quietness around the other men. In reality Dan was worried about Billie. Though this is not something that he would like to admit as it may show a sign of weakness and as such leave him vulnerable. However the important thing for both Billie and Dan is that they are both alive. That neither man has lost his life in battle. As to whether there will be a thawing in Billie and Dan’s relationship is difficult to say as both men are headstrong and the civilities they show one another at the end of the story may not necessarily last. McManus, Dermot. "The Little Regiment by Stephen Crane." The Sitting Bee. The Sitting Bee, 12 Oct. 2018. Web.